I've been thinking a lot about our trip, even though it is still over two months away (if you've spotted the clock counting down in the sidebar, that's what it's for). It will be my first trip to Europe so I'm pretty darn excited! Tom has been several times on business so he'll make an excellent tour guide. Although much of the time I spend daydreaming about all the sights we'll see and the food we'll eat and the adventures we'll have, I do spend a fair amount of time wondering about what I'll pack. As I mentioned before, we're not checking any luggage and will each have to fit everything we're carrying into a backpack (these backpacks to be exact). That means lots of comfortable basics, good shoes for walking, things I can mix-and-match and pieces that won't get all wrinkly after being stuffed into said backpacks. What I have in mind looks a lot like the spring/summer offering from A.P.C. I think I could mix-and-match my way through a two week trip with what you see here. love your taste in basics! You can do it! My boyfriend went to grad school in the Netherlands, and whenever I visited I never checked a bag. I lived out of my tiny carry on for anywhere from two weeks to a month. My one nugget of advice would be to avoid bringing clothing that stretches out after a few wears. No one feels cute in saggy skinny jeans. Oh, and a pair of waterproof shoes! I am planning for a similar trip, and I've realised how much a good bag is necessary. We're planning on renting an apartment in London for a month and going on short trips to the Continent, so a good overnight bag will be totally necessary. 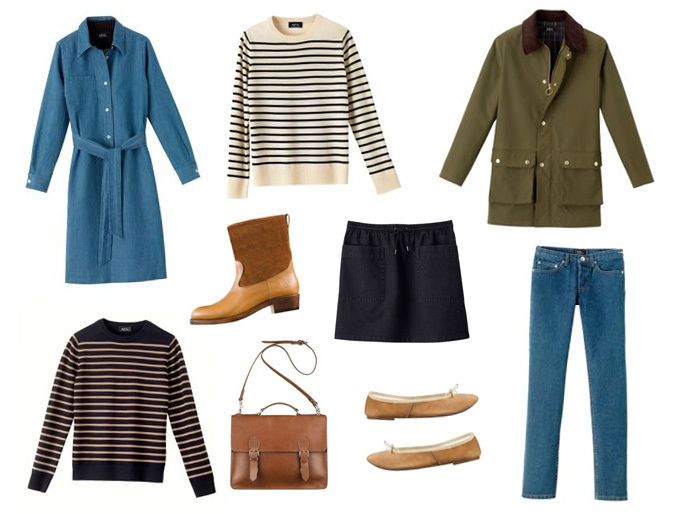 I love the idea of a mix and match travel wardrobe, stripes and a good coat and walking shoes. Lovely! So exciting! Where are you headed? 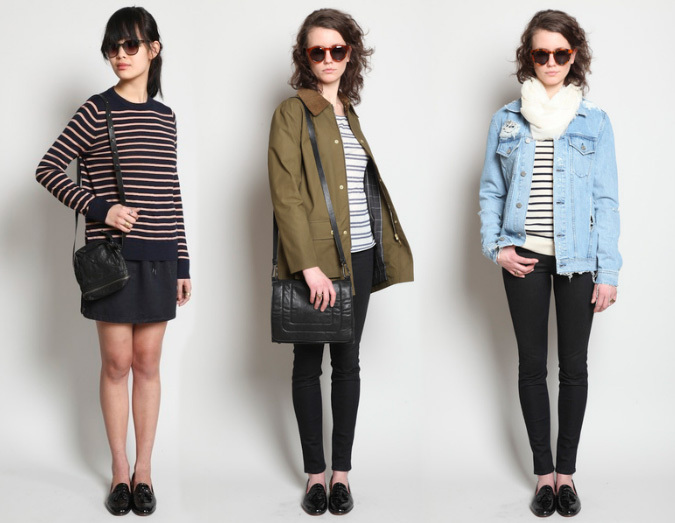 These basics look like great picks for just about anywhere. I live in Europe and travel between countries all the time and it's definitely doable! Just take a light coat that you can layer sweaters under (and always wear it on the plane), no more than one extra pair of shoes... and take a couple of pretty dresses. Life is not just about remixing, and if the weather's nice, nothing is better than a light dress with comfortable shoes! I really love that olive green jacket! It would go with so many things! a staple! I live in Europe, travel a lot, and my basic advice would be, just pack what you need for 2-3 days. You can always, and you WILL always, find some cute items when travelling around. These you can pack up in a box and post home before you head back home, or do several small parcels if you are around in different countries. oof yes this is just what i need! i am not traveling for a while but when i do i will have to pack so little.. can't wait to see what you end up wearing over there!